Edwin G. Corr, a former American diplomat and professor, is a Senior Research Fellow at the International Programs Center of the University of Oklahoma. Joseph Ginat, a cultural-political anthropologist, is Vice President of International Relations and Research at Netanya Academic College. Shaul Gabbay, a sociologist specializing in social networks, is the Executive Director of the Institute for the Study of Israel in the Middle East (ISIME) at the University of Denver. Distinguished academic and practitioner contributors from the Middle East, Europe and the US present a range of social science oriented options to get the peace process back on track. Using the history of the last half century of talks and negotiations, and contributor experience in negotiations, suggestions, proposals and formulas are presented to the contending parties that would develop a greater level of mutual empathy, understanding and trust that is required to jump-start the stalled peace talks into sincere and serious negotiations needed to achieve a comprehensive, lasting Middle East peace accord. 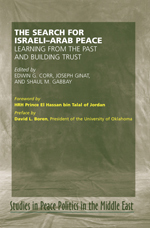 The focus of this volume is on how to achieve an agreement, not on the components of viable peace agreements, which the editors believe largely exist and are the subject of a number of earlier studies, books and the texts of draft accords reached previously in government-to-government and in private-parties negotiations. The editors and contributors assume a two-state solution based on ”land for peace” and emphasize the importance of the role of outside mediators, especially the United States. Throughout the arguments presented, potential dialogue and agreement is overshadowed by the increasingly violent and chaotic environment of the Middle East that began worsening in 2001 with the second intifada and the 2003 US invasion of Iraq. Peace and a final agreement can only be reached through Arabs and Israelis making tough decisions and compromises. Readers will be intrigued, amused, encouraged and disappointed by accounts of incidents that de-railed past talks, the innovative analyses concerning past negotiations, and the potential for application of social science knowledge to the building of trust needed for attaining agreement. 12 The Jordan–Israel Peace Process: How Can We Rebuild Trust and Replace Despair and Division? 15 After the Lebanon War: Can Israel Build Trust with Syria, Lebanon and Palestine? 18 Did Anything Go Wrong? Academic and practicing political and other social scientists suggest how Middle East states and outside mediating powers can get the Middle East peace process back on track. They examine what went wrong in the peace process that caused it to lose momentum and deteriorate into an unending chain of violence and mistrust, and how trust might be restored. It is with great hope and humility that I recommend this thoughtful and dynamic work to anyone with an interest in building peace in the Middle East. The Search for Israeli–Arab Peace picks up the pieces of a shattered peace process and offers hope for rebuilding a framework for dialogue in our fracturing region. It is my belief that lasting peace in the Middle East can only be achieved through a multilateral initiative that can show home-grown, regional credentials. Our worsening situation can yet be saved but only if the actors in this existential and ideological conflict agree to move away from short-term, bilateral policy-making. We must all become champions of foreign relations with equality of treatment and the promise of a more inclusive future for all … It is encouraging that politicians on all sides are increasingly accepting the need for a multilateral approach to our problems. This spirit must not only cross borders but also penetrate society at the ‘Track 2’ level to engage with the region’s free and creative political minds. The events of recent years have proved that frustrating channels of civil expression can only lead to empowerment of extremists and increased alienation of people and government. The Search for Israeli–Arab Peace embodies the creative thought and research of distinguished academics and practitioners on how Middle East states and outside mediating powers can get the peace process back on track. It is in large part a response to the increasingly violent and chaotic environment that began in 2001 with the second Intifada and the 2003 US invasion of Iraq. The situation shows few signs of abatement and threatens to expand. After the failed 1999–2000 Camp David Two Talks almost all bridges of dialogue between Arabs and Israelis have collapsed and the peace process has stagnated. The level of trust among actors that had grown in the aftermath of the Camp David One Accords, Madrid Conference, Oslo Accords, and Jordan–Israel peace agreement has been greatly eroded. … This book’s contributors examine what went wrong in the peace process which caused it to deteriorate into an unending chain of violence and mistrust. They study how trust might be sufficiently increased to allow Palestinians and Israelis to reach a peace accord that might open the way for Israeli peace agreements also with Syria and Lebanon, and the achievement of normal relations with the rest of the Arab world. The contributors focus upon lessons from the past which must be understood if we are to make real and lasting progress. One particular gem is Shlomo Gazit’s account of Sadat’s 1977 trip to Jerusalem. Gazit, who served as chief of Israeli military intelligence at the time, recounts the confusion, political and analytical differences, and Israeli policy improvisation that were sparked by Egypt’s unexpected move – even reproducing his own notes of key meetings. Historians of this period (and, indeed, scholars of intelligence and foreign policymaking) will find his account fascinating. ... A useful volume. An effective overview. Course instructors will certainly note several chapters that can enhance undergraduate reading lists on the Arab–Israeli conflict.